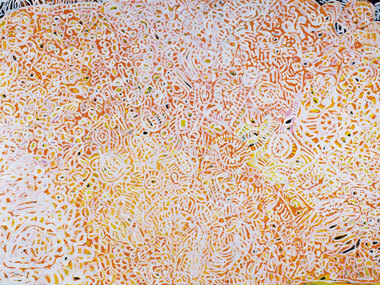 From March to September 2014 ARTKELCH, the leading gallery for Contemporary Aboriginal Fine Art in Germany, presents artists from South Australia´s Eastern APY Lands in their yearly touring exhibition PRO COMMUNITY. PRO COMMUNITY is an exhibition format developed and organized by ARTKELCH in Freiburg, Germany, that features excellent art from community based art centres in a touring exhibition in Germany. Artists from one art centre (or a small group of art centres) from one region per year are thus presented to audiences across Germany. It runs under the patronage of the Australian Embassy in Germany and is accompanied by a catalogue. This year PRO COMMUNITY is presenting a selection of recent work from four small art centres situated in the north of South Australia. Hailed as “last frontier of desert art” Ernabella Art, Kaltjiti Arts, Mimili Maku and Iwantja Arts are currently taking the Australian Art world by storm. The exhibition will start in March at the Art Karlsruhe (13.-16.3.2014) – with its 50.000 visitors the 2rd most important art fair in Germany – and at ARTKELCH in Freiburg (22.3.-5.4.2014) and will then move on to Munich, Hamburg, Stuttgart and the beautiful Lake Constance area. The exhibition leads the viewer directly into nganampa ngura walytja – Anangu country of spirit. Passed down orally for millenia, the songs, the dancing and the painting are so intertwined that we must assume that the artists can actually hear forms and colours and in turn, that the sacred songs themselves from the Inma (ceremonies) are converted into pictures in their work. The exhibition is a tribute to the true synesthetes in desert art, especially the tjilpi (term of respect for the old men), that do paint cultural designs that only a few people still know of. The exhibition consists of more than 80 major works in total. Artists presented include Tjilpi Dickie Minyintiri (Telstra Art Award 2011), Pantjiti Lionel, Pepai Carroll, Carlene Thompson, Tjunkaya Tapaya, Niningka Lewis, Tjariya Stanley, Yurpiya Lionel, Alison Riley, Tjilpi Kunmanara Robin Kankapankatja, Tali Tali Pompey, Kathy Maringka, Taylor Cooper, Milatjari Pumani, Ngupulya Pumani, Betty Pumani, Tuppy Goodwin, Tjilpi Whiskey Tjukangku, Alec Baker,Peter Mungkuri und Vincent Namatjira. It is a vibrant variety of Aboriginal desert art from the lyrical gentle to archaically raw, which ARTKELCH is thrilled to be able to bring to such a broad audience.